With summer just around the corner you need the best products with the best protection. Did you know your hair needs protection from the sun just like your skin? It’s true! Overtime, with sun exposure hair color will fade and your hair will become drier. 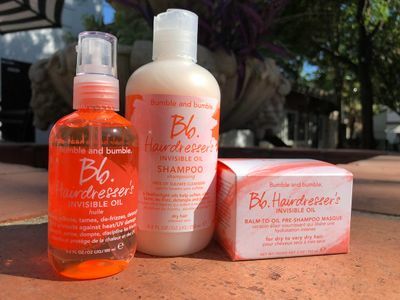 Bumble & Bumble’s Hairdresser’s Invisible Oil Collection is the best line to help maintain hair color and moisture through this heat. 1. Hairdresser’s Invisible Oil Shampoo and Conditioner: Not only is it moisturizing, but, it also adds natural shine, protects from heat, protects from frizz, and keeps your hair hydrated. 2. Hairdresser’s Invisible Oil: Lightweight oil that melts into the hair adding natural shine, UV protection, heat protection, and protects from frizz. 3. Hairdresser’s Invisible Oil Balm-to-Oil Pre-Shampoo Masque: this pre-shampoo hydrates and nourishes the hair. It is oil infused which helps prevent frizz. Who would have thought hair needed UV protection? With this collection you can keep your hair feeling healthy and maintain that beautiful hair color all summer long!